I remember phrases from childhood travels, not images or events. Glass-bottomed boat. Lion Country Safari. Circus Circus. The musicality of the words meant more to me than the actual experiences. All I remember about the glass-bottomed boat was my incredulousness. How could a boat have a glass bottom? I pictured a little motorboat with a slab of window for a bottom. Wasn’t that dangerous? Wouldn’t it break? Couldn’t ladies shatter it with their high heels? I don’t remember the actual boat, or the coral reef, down there in the Florida keys. all I remember is those four syllables, and the fact that my dad went snorkling instead. Snorkling. What a word that was! I couldn’t imagine what he was doing. Dads did mysterious things, though. My dad went to an office downtown most days, and I had no idea what he did there. Snorkle. Glass-bottomed boat. We went to several outfits like Lion Country Safari. We visited one in Florida, and one in Texas. They strike me as ill-conceived now. You stay in your car. “Wild” animals wander around. Giraffe, deer, maybe even ostrich. The lions, my father insists, were actually in cages that you drove by. I remember you could get your photo taken with a lion cub for an extra charge. My parents disapproved of this on the grounds of both safety and thriftiness. I did not get a picture. I just kept the name of the place, forever. Lion Country Safari. Circus Circus, I’m told, is still there. I visited Las Vegas when I was three. My grandmother paid for me to be made up as a clown. I was only spoiled for my first few years, the ones I have the fewest memory of. Afterward, I kept the red foam nose, with a sprinkling of glitter. Sometimes I put it on my nose again. You needed glue to hold it there, though, and I didn’t have that kind of glue at home. You actually need souvenirs to remember trips when you are a child. You actually will forget. Circus Circus. I either saw, or thought I would see, trapeze artists in the atrium. I’m not sure which. We also visited Muir Woods. We ate Chinese food in San Francisco, which I liked as a city name only second to Cincinnati. 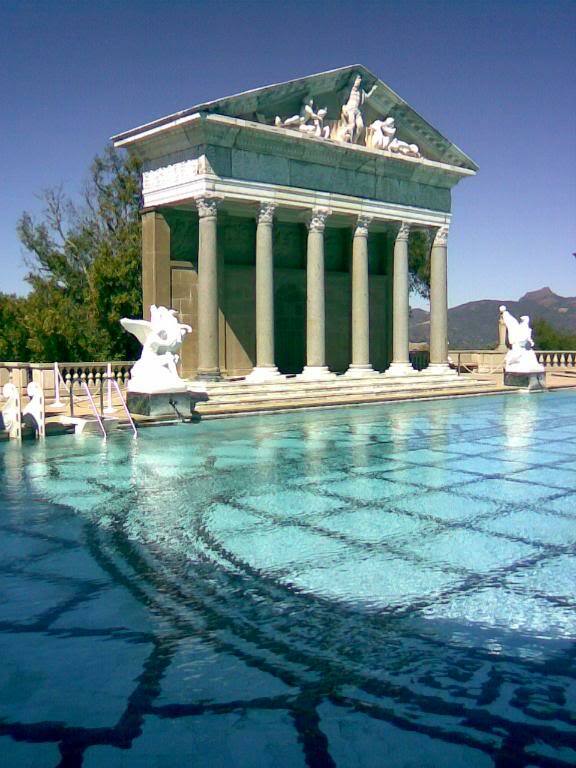 You would think the Hearst Castle would impress more with its architecture than its name, but my world was made of words, not marble. Not that it matters, but you actually did see trapeze artists performing at Circus Circus–also at Circus World and at the Circus downtown, all in your formative years. Life was one circus after another, interspersed with vacations, and office snorkling, in those days. I really thought so– I do have an image of it. But memories that old are so slippery. I have one of those photos with a lion cub. I’m betting they don’t have anything like that now. Too bad as I’d pay for that experience again. Now I think I remember that. Talking to you about the photo thing is probably what made me remember it, too. And yes, probably a slight liability problem nowadays.